Undefeated San Diego prospect Emmanuel “Renegade” Robles takes on Canadian welterweight champion Steve “The Dragon” Claggett in a crossroads fight for both on Friday night, September 9, in the return of “Knockout Night at the D,” airing (11 p.m. ET / 8 p.m. PT) live on CBS Sports Network from the outdoor Downtown Las Vegas Events Center (DLVEC). The “Knockout Night at the D” series, presented by the D Las Vegas and DLVEC, is promoted by Roy Jones Jr. (RJJ) Boxing Promotions. Hall Of Fame announcers Jim “J.R.” Ross and Al Bernstein will call all of the action from ringside on CBS Sports Network. Robles vs. Claggett, promoted in association with Bobby D Presents, is the 10-round main event for the vacant North American Boxing Association (NABA) – United States junior welterweight championship. Sept. 9th has the potential to be the most explosive top-to-bottom card in the already praised 2016 “Knockout Night at the D” series, which consistently showcases tomorrow’s stars in highly competitive, compelling match-ups. “I am excited to showcase my skills once again as the main event on a Roy Jones Jr. Boxing Promotions card,” Robles said. “Both of my promoters, RJJ & Bobby D, are presenting me with such an incredible opportunity to fight for the Regional NABA Title belt. My opponent is in for the boxing lesson of his life. I know Claggett will be a strong contender and brings a power punch to the table. He is going to be challenging, the toughest opponent I’ve had to face thus far in my boxing career, but I am ready to show my opponent and his team the skills that will help me capture the title and bring it home to RJJ and my team. “It’s an honor to display my superior boxing skills for Roy Jones Jr. on CBS Sports Network and I am humbled that Las Vegas has accepted me with such open arms. Defeating Claggett will put me on the map as a contender for the top 140-pounders in the world such as (Adrien) Broner, (Terence) Crawford & (Victor) Postal. The 27-year-old Claggett (23-4-1, 16 KOs) needs to bounce back from a disputed 10-round loss by majority decision the Chris van Heerden in his last fight this past April, also at the DLVEC, to revitalize his career. Claggett is taking a risk by dropping down one weight class in order to challenge junior welterweight Robles. “This fight means everything to me,” Claggett explained. It is a make or break fight for my career and I have a chance to re-enter the boxing world at 140 pounds, which is a weight that I believe I should have been fighting at a little while ago. I have a new trainer for the first time – a new team – and I am looking forward to showing fans a new fighter. A victory will stamp my name as a true world champion contender. I understand my position and I know that I am on the ‘B’ side, but I have been in this position many times before. I have a lot of experience in the sport of boxing and it has finally all come together for me. This will be my best fight. My focus and training will show on fight night. A firefight is developing for the 8-round co-feature between unbeaten prospects Rolando “Rola” Garza (9-0, 6 KOs) and Neeco “Roster” Macias (12-0, 6 KOs), who will throw-down for the vacant WBC – US junior middleweight championship. The opening 4-round television fight pits two young welterweights, local favorite Jeremy “J-Flash” Nichols (5-0, 2 KOs) and Texan Steve Belmonte (2-0), in another rare showdown between unbeaten prospects. Also scheduled to fight on the undercards are undefeated Ugandan lightweight prospect Ismail “Sharp Shooter” Muwendo (17-0, 11 KOs), fighting out of Minneapolis, in an 8-rounder vs. TBA. In 4-round fights, 20-year-old junior lightweight Randy Moreno (3-0, 2 KOs), of Las Vegas, will be matched against an opponent to be announced and Las Vegas junior flyweight Marina Ramirez (1-0) meets New Jersey’s Rachel “The Black Widow” Sazoff (0-1). 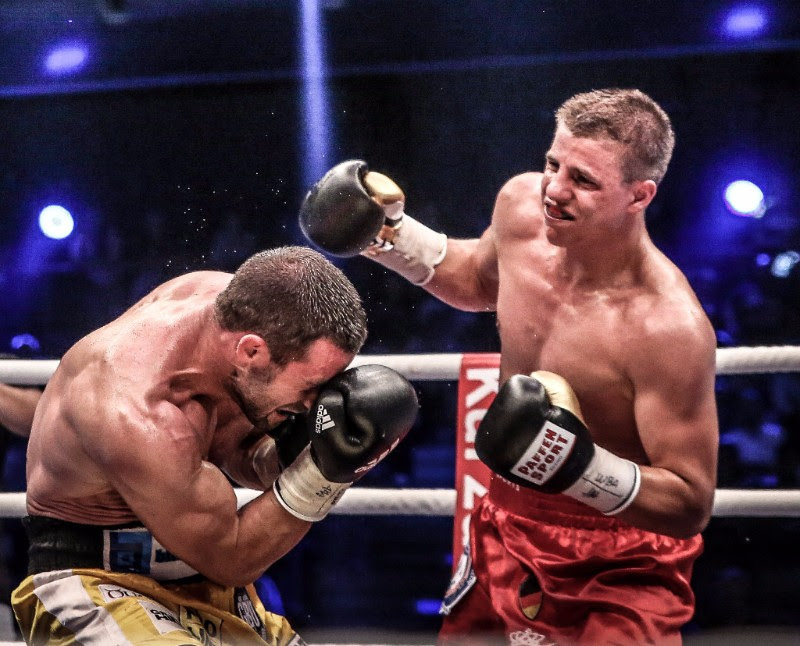 Tyron Zeuge (18-0-1, 10 KOs) is set to renew his rivalry with Giovanni De Carolis (24-6-1, 12 KOs) on November 5 in a WBA World Super Middleweight title rematch at the MBS Arena in Potsdam, Germany. The fighters will pick up where they left off following their World title tussle at the Max-Schmeling-Halle in Berlin on July 16, which after twelve fiercely contested rounds ended with a majority draw decision. Two judges scored the fight 114-114, while the third had Zeuge ahead 115-114. ‘’As a Champion you must be ready for any challenge,’’ said the 32 year-old, who aims to continue his fine run of form with another World title victory on German soil. Promoter Kalle Sauerland says he is looking forward to the rematch, and having been impressed by his performance last time out, has tipped Zeuge to overcome De Caolis and claim World honours at the second time of asking.